SAN MATEO, USA -- Franklin Templeton bond chief Michael Hasenstab is pulling back from one of his most contrarian bets of the past decade. Holdings in Ukrainian sovereign debt in the flagship $40 billion Templeton Global Bond Fund he manages have dropped by half in the past year to about $1.2 billion, or 3 percent of the total portfolio, according to filings posted on the fund manager’s website. Most of the reduction was in Ukraine’s shortest-dated bonds, maturing before the end of 2021, according to data compiled by Bloomberg. A spokesperson for Franklin Templeton declined to comment on the fund’s holdings when contacted by email. “Some rather consistent selling was visible in the market over the last of couple months,” said Fyodor Bahnenko, a managing director for fixed-income trading at Dragon Capital in Kiev. “A broader diversified investor base is a good thing in principle, but some bonds may be in shakier hands now and so that may increase the market’s volatility.” Franklin Templeton became Ukraine’s biggest private creditor in 2013, with an investment of about $7 billion across funds, the year before a revolution toppled the country’s former president, prompting a separatist insurgency in its eastern regions. The fighting crippled Ukraine’s finances, forcing it to seek a sovereign-debt restructuring in 2015. The Ukrainian investment highlighted the risks of Hasenstab’s unusual strategy of making outsized wagers in unloved markets. He managed to salvage the bet by helping broker a restructuring deal with Ukraine in 2015 that gave more favorable terms than expected to creditors. 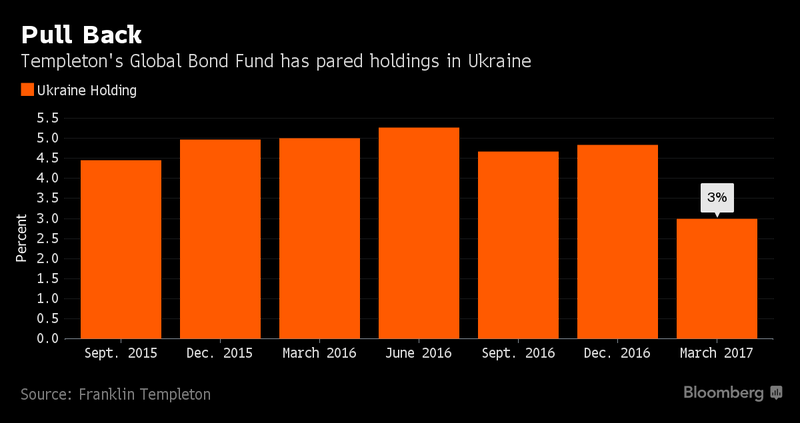 Since the restructuring, Ukrainian bonds have contributed to a 12 percent return to the Templeton Global Bond Fund, according to data compiled by Bloomberg. Ukrainian Eurobonds maturing in September 2021 have dropped 2 percent since reaching a post-restructuring high of 100.4 cents in January. Last year, the Templeton Global Bond Fund began reducing its holdings in that bond and one maturing in September 2020 and sold out completely in the first quarter of 2017, according to data compiled by Bloomberg. The fund also reduced its investment in six other longer-dated Ukrainian Eurobonds, but has held onto its position in GDP warrants that were offered to creditors as a sweetener in the debt restructuring, the data show. Interest in Ukrainian bonds has increased, making it relatively easy for Templeton to find buyers, according to Dragon’s Bahnenko. Global emerging-market bond funds, which typically include Ukraine in their benchmarks, have attracted about $25 billion of new investment this year, according to Bank of America Merrill Lynch, while an ETF that tracks developing-nation debt has swelled to over $10 billion. Templeton’s pullback from Ukraine fits a broader strategy of shifting focus from Europe to Latin America. The fund had completely pulled out of Poland by the end of last year and has aggressively built positions in the local-currency debt of Brazil, Colombia and Argentina in the past two years. Hasenstab said in a research note published in January that he was impressed by the efforts of leaders in Brazil and Argentina to move away from protectionism. Ukraine’s leadership has made slow progress in tackling corruption and overhauling some parts of its economy following the 2014 revolution, prompting many of the country’s most prominent reformist politicians to quit their posts.